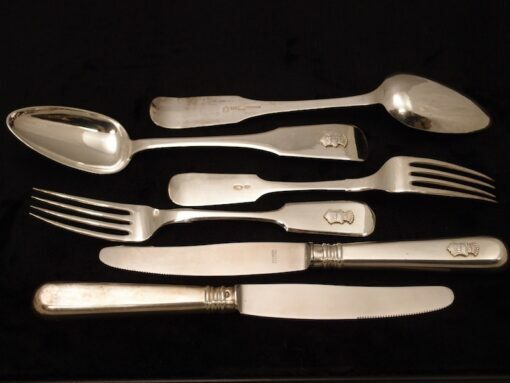 The Baron von Behr cutlery set of 30 pieces of Russian pre-Revolutionary silver is in wonderful condition. It comprises 10 each dinner forks, large spoons, and knives with later stainless steel blades. Each of the pieces is 875/1000 Russian silver, hallmarked for Riga. Each also has a cast-in armorial. The shield shows a bear, and is surmounted by an open coronet with seven pearls, indicative of the peeraege of Baron. The main seat of Barons von Behr from 1561 til 1920 was Edole Castle. It was badly damaged by fire during the 1905 Russian Revolution. After this there was amajor rebuilding and refurnishing programme of replacement. This ties in with the 1908-17 date of the forks and knives. The spoons are various late 19th century dates. Baron Paul Baltazar von Behr is a possible commissioner of the 1908-1917 pieces. He served with the White Russians during the Civil War and moved to Canada in 1926, having spent time in Germany.